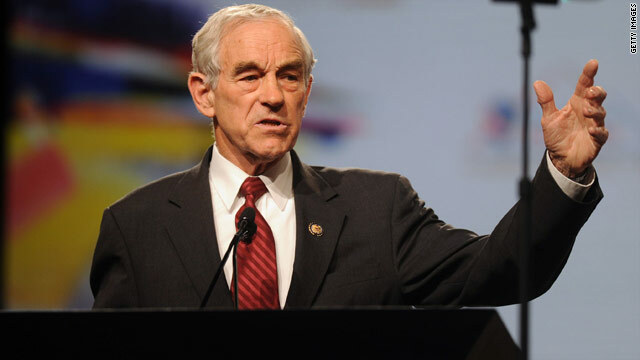 (CNN)-Saying "the time is right" because more people agree with his positions, Rep. Ron Paul of Texas on Friday announced his candidacy for the Republican presidential nomination. The long-time lawmaker, who was first elected to the House of Representatives 35 years ago, says he's optimistic about his chances and that his "supporters are enthusiastic." The 75-year-old Paul, whose libertarian views and outspoken criticism of American foreign and monetary policy has often put him at odds with the GOP, made his announcement on ABC's "Good Morning America." Paul is expected to repeat his announcement of candidacy later Friday at a campaign event in Exeter, New Hampshire, where he's also expected to receive several endorsements. This is Paul's third bid for the White House. He ran as a libertarian in 1988 and for the Republican nomination four years ago. His campaign in the last presidential election raised eyebrows, thanks to the energy and enthusiasm of his legions of supporters, and thanks to his online fundraising prowess. He brought in millions of dollars in one- to two-day fundraising efforts - or so-called "money bombs." When it comes to fundraising, it seems that Paul picked up in 2011 where he left off after he dropped out of the 2008 campaign. He raised more than $1 million in a 24-hour period last week, timed to coincide with his appearance at the first Republican presidential debate in Greenville, South Carolina. Paul has hinted for months that he could launch another bid for the White House. His aides announced on April 14 that he had formed a "testing the waters" account and 12 days later announced the formation of an official presidential exploratory committee. Paul made that announcement in Iowa, the state which holds the first contest in the presidential primary and caucus calendar. New Hampshire comes second on the calendar. After the event in Exeter on Friday, Paul is scheduled to attend a dinner in Lebanon hosted by the Grafton County Republican Party. Paul generally holds a non-intervention stance when it comes to foreign policy, believing that the U.S. should avoid entangling alliances with other nations and avoid all wars not related directly to self defense of the country. Paul voted against the resolution authorizing the Iraq war. He also advocates withdrawing U.S. participation and funding from such organizations as the United Nations and NATO. Paul has taken issue with the way the raid against Osama Bin Laden was carried out, saying that "we could have done it differently," and added that he would have carried out the mission to kill the founder and leader of the al Qaeda terrorist network in a different way than President Obama handled the situation. But as for the killing of the man behind the 9/11 terrorist attacks, he says "I'm delighted he's gone." On fiscal issues, Paul is a strong believer in free market principles and has called for abolishing the Federal Reserve. Thanks to his stance on economic issues, Paul enjoys strong support from many Tea Party activists. For two straight years, he's won the presidential straw poll at the Conservative Political Action Conference. The most recent CNN/Opinion Research Corp. poll indicated that 10 percent of Republicans and independents who lean towards the GOP support Paul for their party's nomination, which places him fifth in the horse race. But the same survey also indicated that in a hypothetical 2012 general election head-to-head with Obama, Paul trailed by 7 percent, performing better than any other probable or possible Republican candidate. Paul's son Rand, who like his father is a doctor, won election to the Senate from Kentucky last November. Earlier this year the younger Paul said there was a chance he would enter the race for the GOP nomination if his father didn't. Rep. Ron Paul will appear on CNN's "The Situation Room" to discuss his 2012 candidacy for president Friday. I would've voted for Ron Paul in 2004 but not now. For a Republican who really leans toward Libertarianism, I like what he stands for but let's be serious. President Obama's presidency has quietly been one of the most successful in recent history. In today's society where the media dominates everything it's a wonder that his administration has gotten anything accomplished. The equal pay act for women, the bailout of the auto industry, the repeal of DADT, and health care reform (affordable health care act) speak for themselves. Oh, and our Seals killed Bin Laden. Ron Paul offers the American people hope. Something that we have not had for a long, long time. He will return America to Americans. Stop all the war nonsense, get started on rebuilding our infrastructure, legalize marijuana and end the worthles War on Drugs, get our crooked health care system back on track and take back our country from the facist corporations that have been leading us like we have a ring in our nose. As much as I think Ron Paul might have a good overall plan for running things as President, getting either party of Congress to support him in any way would be an uphill battle that would either water his ideas down to impotence or make him completely ineffective in the position. That's the difficulty with being "radical" in this political climate – unless you're party-line GOP or Dem, you'll never keep the Congressional sheep in line. Liberals need to Wake Up! Our government is dangerously in debt. The dollar is in free fall and China is divesting. Libs appear to ne in some Obama Coma and can't figure out that he and the Dems in Congress added FOUR more trillion to our debt in two years. We educated American's are upset with Obama being a puppet to the banks and the military industrial complex. Though I will never throw my vote to Ron Paul, but I have to admit that listening him talking, he really puts my High Blood Pressure down (instead of using medicine); while listening to the "Lady from Alaska" my pressure always shoots up! I loved his speech the other day on drug and prostitution prohibition. So, how many people here on this board would use heroin if it were to become legal? None? Why not? Do you choose not to because government says you can't, or because you have enough common sense to know it is stupid? It is not illegal for me to grab a fully charged electric fence. I choose not to do it because I don't want to shocked. But I love the fact that I have the choice to decide if I want to or not!!! I welcome this candidacy. By now he is running boiler plate politics. Constituents are so used to expecting him being involved, that some will ignore him. That will have the effect of splitting the party run, and improving Obama's chances. Yes, he is the man for the job! The Libertarian party is what we need in this bad state our country is in. The USA is about ready to DEFAULT on it's debt. obama added FOUR more trillion in just two years! Our countries greatest enemy is the unneeded privately owned Federal Reserve. 1/8 of our Federal Income tax goes to run the government 7/8 goes to pay our debt to the FR. Yes This is the guy the US needs, and let us get back to the principles in which it was founded not through lawyers and big business and special interests.. We can go back to the way this country was based upon the original constitution, not a bunch of changes made to suit the big business and rich people who have no concept what it is like to go pay check to pay check. It is time to stop the war mongering and greed that has overcame this country. Today is our day to overcome. Go ahead..check how he votes..always for our constitution not the $$$ interests. He has a recorded history in our favor. This is the one chance to return our country to the way it was ment to be. Question Authority...Think For Yourself. Support and vote Ron Paul. Who hates Ron Paul more? Right Wing mafia values "conservatives" or hitmen loving liberals? Come to think of it- what's the difference between them anyway? I'm glad to read that Ron Paul is running. He won't win but I feel like I can vote for someone and have a clear concience doing so. I will never vote for a Republican apart from Ron Paul ever again. One of the main reasons, I will support Paul again, is because I am SO tired of my money going to people in countries that (#1) hate us, and more importantly, the U.S. can't and shouldn't solve all the problems of the world. The other main reason I support Mr. Paul is that he believes leaving the private lives, in the hands of citizens. The ONLY thing government needs to do, is the business of running the government which doesn't include the regulation of free American citizens. One groups ideology (religious or similar) needs to keep their noses to themselves. On a slight different slant, to the "Searching For An Atheist Extremist..." ... I hope I live to see the day when all people elected to any office across this country that realizes the Constitution says "there shall be no test of religion" in order to hold office! Keep Church and State Separate forever. America needs RON PAUL! He is the only person that has the record that backs up everything he has been saying. Restore the Republic! Let's do this thing!! Paul lacks the OBVIOUS vituperative hatred of the other GOP candidates which is why some moderates support him. However if he PANDERS to that cacophony of zealots that comprise ALL the Tea Party factions, he will loose his limited appeal. As a Libertarian, a "conservative", a fiscally responsible adult (that`s what the TP CLAIMS to stand for). I like to know if Mr. Paul suppoorts or REJECTS free market principles. Question 1: should Oil companies get Government money- SUBSIDIES? Or does that make them less capitalistic and more of a partially state supported, partially NATIONALIZED Industry? YES or NO please. No deflecting to talk about other distractions. This is probably the only guy that would pose a real threat to Obama. The problem is the GOP won't give him the nomination, even though he's won every straw poll at conservative gatherings. Wow I have never seen so many positive posts for a politician since they started allowing blogs on CNN. I agree with RP. Now if the American people can get behind him. America would be unstoppable!!! Ron Paul is the only person that has the proven record of doing exactly what he says. Let's restore our once great Republic! the only man in Washington I trust! Rep. Paul's "plan" is a throwback to the 18th Century. It might have worked then (although I doubt it). But 300 years later, we need a government that is big and strong enough to deal with multi-national corporations with more money than most countries, China, terrorism, and a world that has moved beyond an economy of yoeman farmers, and a romantic defense consisting of wooden ships and iron men. We would all be far better off if Rep. Paul returned to his medical practice.